Dolph Ziggler defeated Seth Rollins 5-4 in the 30-minute Iron Man Match to retain the Intercontinental Championship. 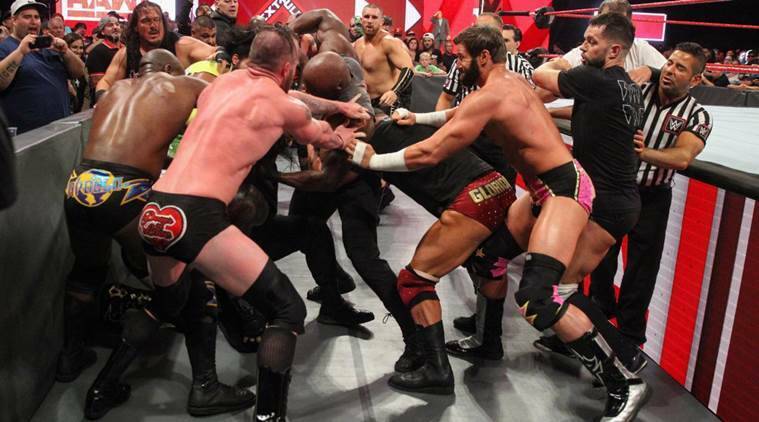 WWE Extreme Rules was not expected to be a great pay-per-view with a very deflated match card. But the show kicked off with an epic Tables match between Sanity and The New Day. WWE should learn a lesson to never put The New Day in a Kickoff show. And definitely, Not Sanity! Moving further, the matches saw a series of predictable results and twists. But the truly shocking moment came when The MONSTER AMONG MEN Braun Strowman threw Kevin Owens on the table from the top of the steel cage. EPIC! Ronda Rousey’s intrusion in Alexa Bliss match was good, though it was wasted by Mickie James. The WWE title fight between AJ Styles and Rusev was okayish. Nakamura vs Hardy total flop – Orton’s return – Mega flop. But the match of the night was the 30-minute Iron Man Match between Dolph Ziggler and Seth Rollins. That is one hell of a booking, and it kept the audience on the edge of the seat till the credits started rolling in. WWE Extreme Rules was not expected to be a great pay-per-view with a very deflated match card. But the show kicked off with an epic Tables match between Sanity and The New Day. WWE should learn a lesson to never put The New Day in a Kickoff show. And definitely, Not Sanity! Moving further, the matches saw a series of predictable results and twists. But the truly shocking moment came when The MONSTER AMONG MEN Braun Strowman threw Kevin Owens on the table from the top of the steel cage. EPIC! Ronda Rousey's intrusion in Alexa Bliss match was good, though it was wasted by Mickie James. The WWE title fight between AJ Styles and Rusev was okayish. Nakamura vs Hardy total flop - Orton's return - Mega flop. But the match of the night was the 30-minute Iron Man Match between Dolph Ziggler and Seth Rollins. That is one hell of a booking, and it kept the audience on the edge of the seat till the credits started rolling in. DOLPH ZIGGLER BEATS SETH ROLLINS! DOLPH ZIGGLER PINS DOWN SETH ROLLINS TO REATAIN INTERCONTINENTAL CHAMPIONSHIP! Drew McINtyre came out of nowhere and it distracted Seth Rollins to go and counter the threat. But Ziggler came from behind and delivered Zig Zag to go for a pin. ONE. TWO. THREE. ZIGGLER WINS 5-4! WWE RAW General Manager Kurt Angle comes out to announce that the match will continue with a sudden death over time! SETH ROLLINS DELIVERS STOMP TO DOLPH ZIGGLER WITH JUST 8 SECONDS LEFT ON THE CLOCK! Can he go for a cover here? NOOOO, the clocks run out! The match ends in a tie. In the case of a tie, the Champion retains the title and still the Intercontinental Champion... Dolph Ziggler! Seth Rollins has locked Dolph Ziggler in a submission move with just one minute to go but Ziggler counters and walks away, ready to take the tie and keep the title! SETH ROLLINS HAS FINALLY CAUGHT DOLPH ZIGGLER WITH A PINFALL WITH LESS THAN 3 MINUTES TO GO! Get a new box of popcorn because we might just have a big upset here! SETH ROLLINS DELIVERS A SUPERPLEX-FALCON ARROW COMBINATION ON DOLPH ZIGGLER! Rollins goes for the cover. One. Two... ZIGGLER KICKS OUT! What does Rollins has to do! Seth Rollins finally connects the Frog Splash on Dolph Ziggler but Ziggler still managed to kick out. Just 6 minutes to go and Ziggler still leads by one fall. No time left for Rollins and he might just lose here. SMART MOVE FROM DOLPH ZIGGLER! Seth Rolins take a look at the clock and realises that not much time left to cut the deficit. He tries to go on top of the ropes but Ziggler delivers a drop kick and Rollins falls down from the top rope outside the ring. Dolph Ziggler has picked up another fall after he put down Seth Rollins with a palm strike on the face while the Kingslayer was attempting a suicide dive. Ziggler then uses the ropes to go for the pinfall but the referee did not see it and Ziggler gets another pinfall. Ziggler leads 4-3 with still over 16 minutes to go. 17:50 on the clock and score is 3-3! In under two minutes, Dolph Ziggler has levelled things up after the brutal assault on Seth Rollins by Drew McIntyre. Now the score is levelled at 3-3 and there is still over 17 minutes on the clock. This is INSANE! DREW MCINTYRE BEATS DOWN SETH ROLLINS! Drew McIntyre has beaten the hell out of Seth Rollins and Rollins gets a pinfall by Disqualification! Rollins leads 3-0! But the beatdown has helped Dolph Ziggler to pick up two pinfalls in under a minute and now the score is closed down to at 3-2! SETH ROLLINS IS NOW AT 2-0 LEAD! After 8 minutes into the fight, Seth Rollins puts himself in the driver's set as he takes down Dolph Ziggler with a Stomp and then takes up a 2-0 lead in the match. Seth Rollins has picked up a 1-0 lead over Dolph Ziggler in the 5 minutes after he delivers a perfect buckle bomb to Ziggler and then rolled him over for a pinfall. Rollins is in the lead but 25 minutes still on the clock. Notice, Drew McIntyre standing behind and he could be the game changer tonight! Can Seth Rollins BURN IT DOWN? Intercontinental Champion will be on the line as The Kingslayer takes on The Showoff Dolph Ziggler to challenge for the Intercontinental Championship This will be a 30-minute Iron Man match, which means that the individual with most number of pinfalls in 30-minutes will win the match. AJ STYLES WINS WWE CHAMPIONSHIP! AJ STYLES BEATS RUSEV TO RETAIN WWE CHAMPIONSHIP! AJ Styles' phenomenal reign continues as he pins down Rusev after a Phenomenal Forearm! WHAT A MATCH! But in the end, no Rusev Day celebrations tonight. RUSEV FACE FIRST ON THE EXPOSED BUCKLE! Aiden English tried to be cheeky and took off the ring covers to leave the rign buckle exposed. But it came back to haunt Rusev after Styles countered to drop Rusev face first on the ring buckle. Goes for 480 slam. BUT RUSEV KICKS OUT! We almost had a Rusev Day celebration with Rusev delivering a Machka Kick to AJ Styles on the face after Styles was distracted by Aiden English. He goes down for the cover, but Styles kicked out! Rusev tried to go for a suicide dive to take down AJ Styles who was outside the ring. But Styles found a way to smack Rusev right on the face with a punch. Rusev is seeing stars and birds as he is knocked out cold! AJ Styles jumpes from the top of the ring to smackdown Rusev with a phenomena forearm! Rusev is down and out. But Styles cannot pin outside the ring. He drags him inside and continues the beating. Rusev is giving his all! Rusev has locked AJ Styles in a body lock. He is trying to wear out his opponent to cancel out his strength and stamina. Rusev knows this could be his final shot at the title in a long time. AJ STYLES VS RUSEV - WWE CHAMPIONSHIP TITLE! Will the Phenomenal One carry on his WWE title reign or will the Pittsburgh celebrate the Rusev Day? The two are set to compete for the WWE Championship fight. ALEXA BLISS BEATS NIA JAX! ANd still the Raw Women's Champion, NIA JAX! Alexa Bliss teamedup with Mickie James as both the superstars beat down Nia Jax with steel chairs. Extreme Rules, anything goes. Bliss then delivered a DDT to Jax on a steel chair. ONE. TWO. THREE! RONDA ROUSEY HAS BEEN UNLEASHED! Seeing her friend Natalya being beaten down by James and Bliss, Ronda Rousey decided to intervene and she just beats the heck out of it Mickie James! Alexa Bliss decides to walk away, but Rousey gives her the chase. James hammers down Rousey with a candlestick! Natalya has come out to aid! Natalya has come out to take out Mickie HJames who has been helping Alexa Bliss throughout the match. But Bliss teams up with James to take out Natalya! NIA JAX IS A BEAST! Nia Jax and Alexa Bliss are involved in an Extreme Rules fight and Alexa Bliss tries to bring out the toys early on. Bliss dugs out chairs and trash can from under the ring but Nia Jax just keeps taking them away from her. Next up - Alexa Bliss vs Nia Jax - Raw Women's Championship! Alexa Bliss will defend her Raw Women's Championship against Nia Jax. And just to make it clear, Ronda Rousey is here as she has bought a first-row ticket to the event. BOBBY LASHLEY BEATS ROMAN REIGNS! THIS IS BOBBY LASHLEY'S YARD! Bobby Lashley tried to go on the top of the ring, but Roman Reigns smacked him with a Superman Punch on the face. He tried to go for a spear, but Lashley ducked, and hit a spear of his own. BOBBY LASHLEY HAS BEEN HURT! mBOBBY LASHLEY HAS BEEN THROWN DOWN OUTSIDE THE RING BY ROMAN REIGNS! THUDDDDD! The referee checks up on him, but he says he will continue. How can you stand up after that? It has been the Big Dog's night so far and just when it looked Reigns was looked to finish things off, Lashley delivers a powerslam to Reigns to get back into the match. He then throws his body on Reigns to take him down. WWE Extreme Rules Highlights: Things are about to go Extreme as WWE kicks off its latest pay-per-view Extreme Rules. All the title will be on the line as superstars from both Raw and Smackdown compete in some of the most gruelling matches. Except for the WWE Universal title, all champions will defend their titles. Extreme Rules is a pay-per-view where the rules will be extreme, and there will be different stipulations in every match.